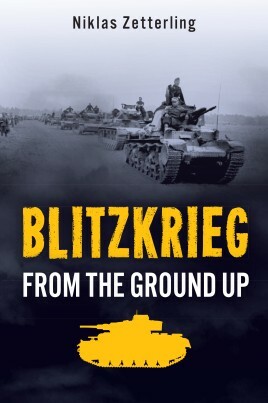 Blitzkrieg (Lightning War) From The Ground Up, is an interesting book. Usually an author would pick either the big picture or the smaller one for his work. "Blitzkrieg' not only shows you the big picture, economically, strategically, but also takes you right into the Panzers. This book looks at the nuts and bolts of the German army during the blitzkrieg years. It gives you a background on the theory of blitzkrieg war-making as well. The timeline of the book is operations from 1939 until the end of 1941. These are the years of the stunning German victories. Almost the entire continent of Europe was prostrate or allied to the Germans by June of 1941. How did this happen in such a short time? Mr. Zetterling's attempt to show us the how and why succeeds admirably. He takes us from the attack on Poland to the assault on Norway. This is a bit strange for books dealing with the blitzkrieg years. Usually in these books the Norway campaign is treated as just a footnote. The author shows how this invasion fits in with the German theories and their usage in this war. The humbling of France is gone into. Although it was a quick campaign, the fighting was hard and deadly even after the Allies' success at Dunkirk. Although out-generaled and maneuvered by the Germans, the French did not go down easy. Next, we go to Russia and that fateful day of June 22nd 1941. Between that day and December 7th 1941 the Germans' fate was sealed. The campaign of Barbarossa is shown to us from the top echelons down to the driver in a tank. The Germans must have thought they were dealing with the zombie apocalypse. No matter how many Soviets they captured or killed, ten more took their place. The author shows that after the German defeat in the winter of 1941, the war changed into one of attrition. The war in Europe had turned into a 'materials' war that Germany could never win. As usual, this Casemate Publishers book is a well written and absorbing read. For those of us who are interested in the tactics and strategy of the early war years, it is a book you won't want to miss.